For the past two months, Kitty Doe’s life has been a lie. Forced to impersonate the Prime Minister’s niece, her frustration grows as her trust in her fake fiancé cracks, her real boyfriend is forbidden and the Blackcoats keep her in the dark more than ever. But in the midst of discovering that her role in the Hart family may not be as coincidental as she thought, she’s accused of treason and is forced to face her greatest fear: Elsewhere. A prison where no one can escape. 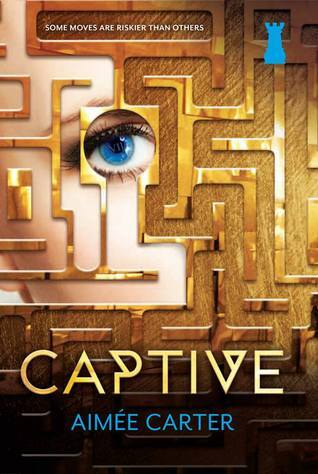 Captive is the sequel to Pawn. If you haven’t read the first book, I suggest you check it out…otherwise you may be just a teensy bit lost what with all the spoilers here and the rambling about characters you haven’t even had time to hate yet (Benji: hate. Knox: kiss). Still masked as Lila Hart, Kitty is living under the reign of her evil Prime Minister uncle, Daxton Hart. As we learned in the previous book, Daxton is a big fat phony whose true identity is unknown because he’s been masked as well (meaning the real Daxton is probably dead). Cue that soap opera music! Augusta, the matriarch and true Evil Mastermind of the family, is a goner thanks to Kitty shooting her in the last book. Cecilia (Daxton’s sister) and the real Lila are in hiding now and the Blackcoats are moving forward in planning their rebellion. Knox, Lila’s fiancé (that Kitty has to pretend to be engaged to) is still deeply involved with the Blackcoats. He continues to play the game along with Kitty, trying to guide her through things, even helping her arrange private meetings with her snore inducing boyfriend Benji (whom he’s tagged as his personal assistant). In Captive, things pick up right where they left off. It’s Lila’s birthday soiree and Kitty is being her typical whiny self (I do like her, I swear) and moaning about how she wants to run away somewhere with Benji and live a boring happy life. Because that’s possible. 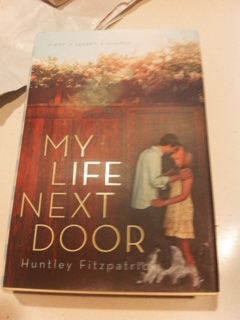 Benji, ever patient, agrees to run away with her but the whole plan falls apart when they’re caught by Daxton himself. This is because Kitty breaks into Daxton’s safe and steals a file containing his true identity. Fake Daxton does not like that. Kitty hides the file somewhere no one can find it, leaving Daxton is furious. Let’s just say that someone ends up dead, someone turns out to be a major traitor, and someone else goes to Elsewhere (hence the book title). This whole portion of the book was a little slow for me. Maybe it’s because, while I expected Kitty to continue to rebel, I imagined her doing it from the Hart home, right under Daxton’s nose. I didn’t want to see Elsewhere or imagine Kitty there. But things got very interesting. Elsewhere introduced a new group of characters, those you’ll instantly hate, those you’ll instantly love, and those you aren’t entirely sure you should trust. Kitty finds Blackcoats there as well, and she learns that while she’s still a prisoner, the fellow residents look up to her as a voice for their cause. Even Mercer, the hardened man who runs her sector, along with his wife, Hannah, offer her a place to stay (not that they’re nice). It’s difficult for Kitty to know who to trust, especially when her situation seems hopeless. As I mentioned, even though I thought Pawn was great, this was a tough start for me. More than halfway through it I was interested but not fully invested. And then there was this moment where it all clicked and I couldn’t wait to pick it up again. There are many twists and turns and revelations. Kitty is better this time around because she grows to be very bold. She begins to worry less about herself and her happy ending with Benji and she sees the bigger picture. Hallelujah! Upping the stakes are a few new characters who are in a category unto themselves (Friend? Enemy? Frenemy?). I can’t even address the love triangle without serious spoilers (which stinks since that’s always my favorite part to discuss). Suffice it to say that there is some serious and well-deserved tension in Kitty’s relationship with Knox. Benji, on the other hand, is still the President of Snoozerville. I just nodded off while typing that. If you liked Pawn I think this is worth your time. The end portion is particularly good, the kind of book I lost sleep over because I couldn’t put it down. Don’t you just love that? Crush Intensity: 4/5 Captive grew on me. I’m eagerly anticipating the third and final book, Queen. 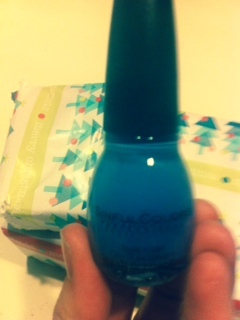 Where’d I Get It: This one was a Christmas present. It’s all mine! It’s no secret that I ADORE my blogging besties from The Selective Collective, And while we’ve taken a mini-break from reviewing books together (because everyone is swamped with life and, you know, reading), we still chatter pretty much endlessly and we have these majorly epic e-mail chains (where we actually talk about things other than books. What?). I’ve still never met one of these girls in person–yet–but they are a big part of my day. So it makes sense that we’d continue our Secret Santa Gift Exchange. As in years past, I was supremely spoiled by my Secret Santa this year. Now, please excuse the quality of the pics. It was evening, we’d just gotten home from Disneyland, and it was a little dim in my dining room where I opened my gifts. But it’s not like I could wait for better lighting, hello. There were presents waiting. 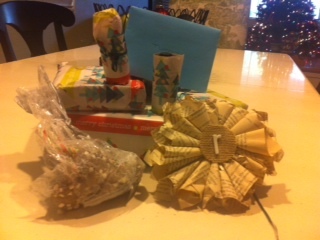 Look at this gorgeous stack of presents I probably don’t deserve but am so excited to receive anyway. My hands aren’t actually that cute and tiny. There was a nine year-old elf who was anxious to help. Ever notice that? 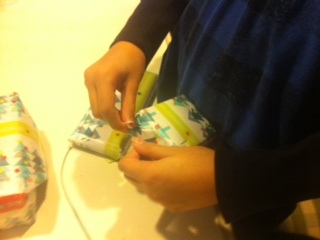 How kids want to unwrap all presents, even if they aren’t for them. Behold. We stood in awe of the amazing Harry Potter charm bracelet before us. It is so cute! 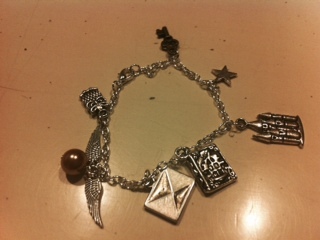 With a Hogwarts acceptance letter charm, a Hedwig, a castle, a several more. I have worn it almost every day since opening this package. 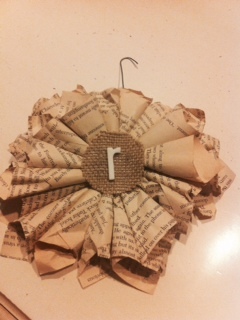 Book pages with an R for my last name. Insta-love. Look at this ornament! I’ve already texted pictures of my home to show my Secret Santa how perfectly this matches with our decor. In fact, this is on my tree now, but after all of the other ornaments are put away this will get a place of honor in a shadow box on the wall. Because I am in love. The pictures do not do these colors justice. I love both of them. 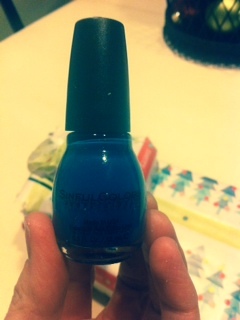 They are something I’d choose for myself in a heartbeat (and I love nail polish!). The one on the left is on my fingers as I type. A book! And this one sounds so cute. 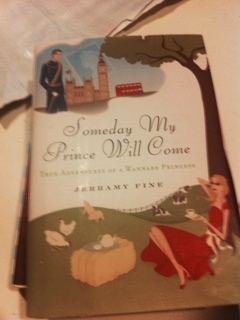 It’s all about a girl who is obsessed with marrying a prince (she’s also in love with all things related to England, so she is my people). I’ve already started it and it’s adorable. Sighs. Swoons. And more sighs. You guys, I love this book. 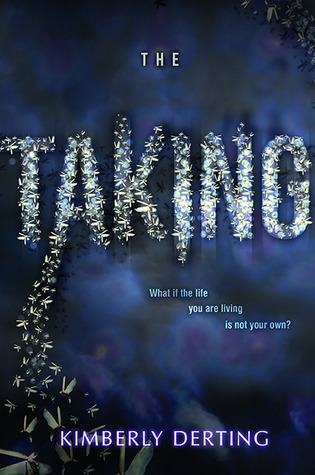 I can’t wait to read it again (I’ve been saying I need a hard copy because I originally borrowed it from the library). 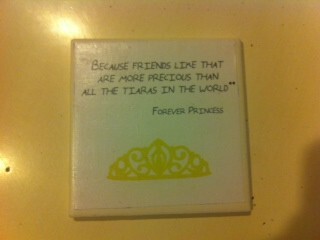 I love all of my gifts, but this was my favorite. 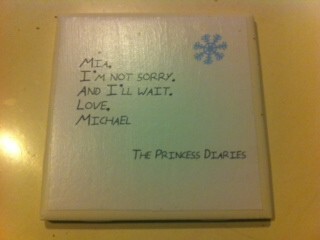 I had an absolute freakout meltdown when I saw these cute Princess Diaries quote coasters that were hand-decorated with me (and my fake boyfriend, Michael Moscovitz) in mind. I’m not joking when I say I CRIED. Real tears as my family looked on in an odd display of amusement and confusion. Because my friends know me so well. They know that, crazy as it sounds, The Princess Diaries is a huge deal to me. It is my favorite series of all time (with Harry Potter as a close second). I re-read these books endlessly and I love Mia Thermopolis and Michael Moscovitz like they’re real. Um, especially Michael. My secret santa was Candice from The Grown Up YA. 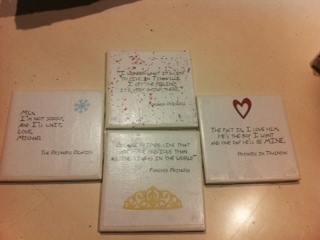 Candice, thank you for the time and thought you put into my gifts. You are such a sweet, dear friend and it means so much to me that you did all of this, and that you truly, truly know me. Now, I’m not sure if I’m supposed to tell whose name I drew this year, but I have to because it’s kind of funny. This year, I pulled the name of Kristina from Gone Pecan. The reason this is funny is because last year Kristina drew my name (and spoiled me, of course!) and last year I drew Candice’s name. In any case, I know it sounds corny, but these friends–Candice, Kristina & Daphne, Sandie & Diana, and Brittany— mean so much to me. They have been a lovely reward to being a blogging book-worm. They are the real gift. I like the whole Tinkerbelle thing going on here. This series has such great cover art. If you have not read The Raven Boys, or The Dream Thieves, first off, I’m sad for you. Second, I cannot be held responsible for any spoilers that might get spoilery and possibly spoil things for you. You have been warned. Maura is gone. Totally up and left and no one seems to know where to find her. Adam still has this weirder than weird connection with the Cabeswater that I don’t think even he understands. Blue still wants to kiss Gansey’s face off but, you know, based on everything she’s been told, it could kill him soooooo maybe now’s not the time. Gansey, unaware that Blue believes she will one day cause her true love’s death, pines for her too, his loyalty to Adam the only thing keeping him away. All the world is still a little bit in love with Gansey—except Ronan (oh, Ronan), who has it bad for Adam. 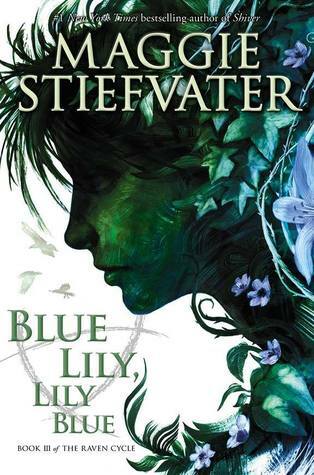 Blue’s family is still as quirky as all get out, and they, along with Blue and her Raven boys, continue to search for the mysterious Glendower. They enlist outside help in the form of some new, interesting characters, and some new bad guys start sniffing around, making life even more difficult. You following? That’s the main thing with this series, a series I LOVE. I have a hard time keeping up. The characters are amazing. Each book tells the story, with a slightly heightened focus on another character. And the whole idea, the whole setting—all of it—it’s totally bananaballs, but in, like, the best way possible. However, trying to keep it all straight –BECAUSE SO MUCH HAPPENS and SO MUCH OF IT IS ABSOLUTELY CRAZY–is difficult. The writing is incredibly gorgeous, as the previous two have been, but take my advice and read the first books again. Or at least skim them. All things considered, this installment was very, very it good. I’d say it was my least favorite of the three so far, but it maintained the spirit of awesome we’ve come to expect from Blue and the boys. Definitely read it, be prepared for a few WHAT THE WHATS, and know that the end will, like its predecessors, leave you hanging on like a yo yo (see how I did that? I made you want to listen to a Wham song). Crush Intensity: 4.25/5 Anxiously awaiting book four. The last one. Sob! Thank you to Netgalley and Scholastic for giving me an e-galley in exchange for an honest review. Princess Diaries Fans of the World, Unite! 2. It’s Adult so there really could be more Michael Moscovitz.I don’t need too many details, but if there’s a tiny bit more steamy kissing than usual, I’m not going to complain. 4. I’ve missed Mia. I really have (not that I don’t obsessively reread the series over and over again. But still). Aaaaaaaand, drumroll, we get a very cute excerpt in which not only is Michael’s sexual prowess discussed (I am not making this up, I swear! ), but we get to see our Mia doing one of the things she does best–freaking out. 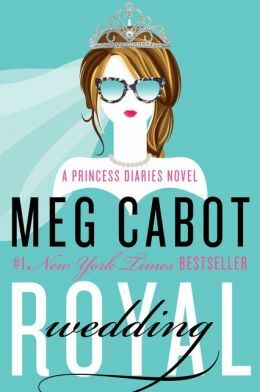 Also, if you aren’t following Meg Cabot on Pinterest, she has a funny board related to the wedding (including Grandmere’s preferences vs. Mia’s). It’s pretty cute. Hope that brightened your day! Even though my daughters, thirteen and nine, are old enough to read themselves to sleep at night, I still try to get in a chapter with each of them at bedtime. Right now the little one and I are reading The Secret Garden (we’ve done the first Harry Potter, the first Allie Finkle, and Ella Enchanted, to name a few). My oldest reads classics, some Middle Grade, and some YA. I monitor what she reads for appropriateness, but I have to be honest, I’m loving the fact that she’s finally able to enjoy some of my favorite books and authors. 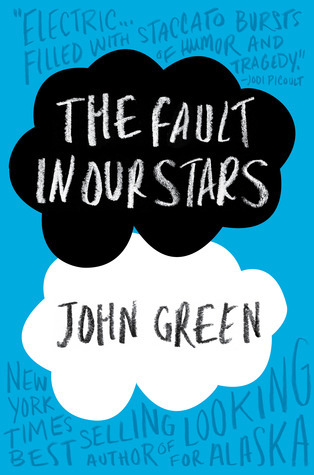 Currently she and I are reading The Fault in Our Stars. Chloe is not a swoony-headed romantic yet (like her mother, cough cough), but she was willing to read this one with me since I’ve loved it for years and all of her friends are bugging her to read it so they can discuss it. It’s fun to see her laugh in all the best parts, and to watch as Augustus charms her. Which brings me to our excerpt last night. It was funny, but, yeah, kind of awkward to read aloud to your sweet, thirteen year old daughter. And since I’ve read this book many times (but always as a fan, not a mom, if that makes even the tiniest bit of sense), I’m sure this will be the first of many an awkward moment. Me: (Insert nervous laughter. That moment where inwardly I say, OMG I can’t believe I’m reading this TO MY CHILD). Me: Um, it’s Kaitlyn. She’s being sort of …crass. Me: (laughing a lot). Let’s move on. Me: Okay, I’m not even going to read the next part. Chloe: Wait. Why? Is it that bad? Me: (occurs to me that she may not actually get it, so I read it). Me: She’s referring to.. you know what? Nevermind. Let’s move on. One of my favorite parts is coming. Sooooo, it’s been a while. I’m sorry. I haven’t fallen off the face of the planet. 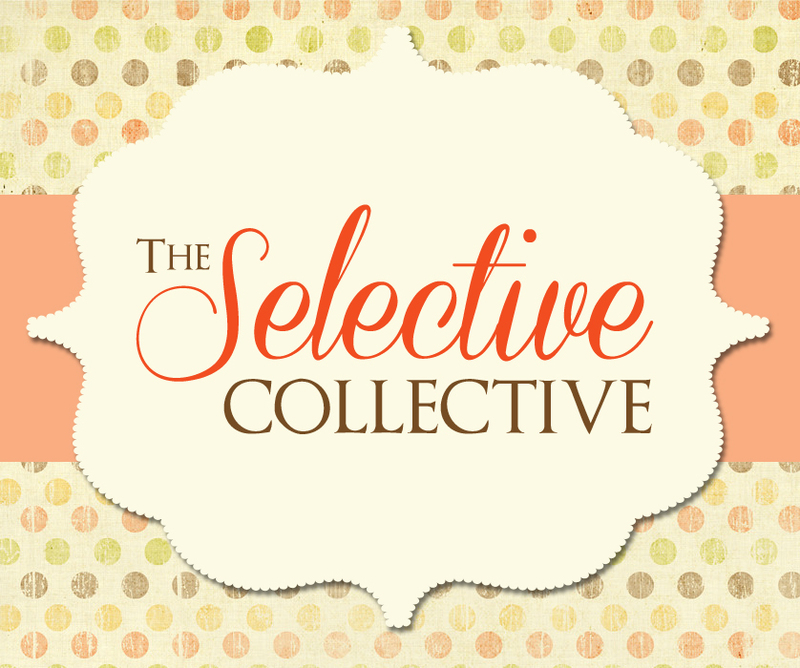 I’m still reading, still writing, still love blogging, but I’ve definitely fallen behind. One thing I didn’t spend this past month doing? NaNoWriMo. Nope. Didn’t happen. 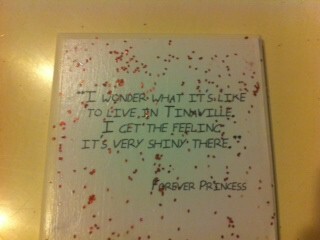 As I mentioned previously, I did do something kind of funny: I reread Twilight. It had been about five years since the last time I’d picked it up. Before that, I’d read it about three times. Back then I was like most people: I was sucked in. I loved Edward, I was engrossed in the whole love triangle, and I hated Bella and Jacob in equal parts (Bella, you can’t be in love with two people. You can’t). So, imagine my surprise when I caught a showing of the film version of my least favorite book in the series, New Moon, over the Halloween season, and I said I’m going to read that series again! It was a strange desire, but hey, I went with it. Here’s what I learned: I still hate Bella. Really, she’s so self-deprecating and such an Edward worshipper that I feel she and I could never truly be friends (it’s essential that I at least respect all of the heroines in my books). I don’t hate Jacob yet. In fact, I forgot that I…wait..liked him in the first book. He was sort of endearing and sweet. I still felt super-wrapped up in the whole who is this crazy hot Cullen dude who keeps staring at Bella like he simultaneously wants to kill her and make out with her? That was fun to read again. Not fun? Bella’s snore-inducing descriptions of her nightly dinner-making. Seriously, how did I get past that five years ago? How did no one see fit to cut that out of the books? I still really liked Alice (when she hugs Bella and comments that “she does smell good”, LOVE). But the rest fell short for me. It wasn’t because I knew what was going to happen (hello, I spend half of my time rereading books to the point that I can practically recite them. It’s about the build up sometimes and not solely the outcome), it was more or less because Bella really has no personality. And Edward–it hurts me to say this–he felt a little blah. A completely, stalkery, devoted blah, but blah just the same. So that’s my reread take. but it’s also because of the magnificent writing, because of the beauty of the story, the angst, the pain, and the humor. Taylor Markham is everything a protagonist should be: flawed and frightened, brave, smart, and equipped with a beautiful heart. She’s a total, crazy enigma at times. She feels so real. She’s broken and yet she embodies such strength and character. I love her connection with Jonah, not just the romantic one (le sigh), but their history, their intensity. And I love the friendships in this story, both the ones in Hannah’s manuscript and the ones Taylor forges. My copy has so many dog-eared pages, and in re-reading it I found that I cried in all the same parts, I swooned in all the same places (maybe more), and I sat on the edge of my seat still waiting and hoping for all to turn out well. I was, once again, truly sad when it was all over again. This is one of those rare books I wanted to climb inside and relive again and again. 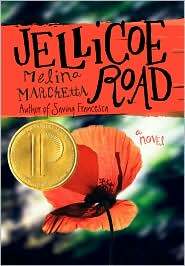 Now, I think books like Twilight and Jellicoe Road both need a place on my shelf. 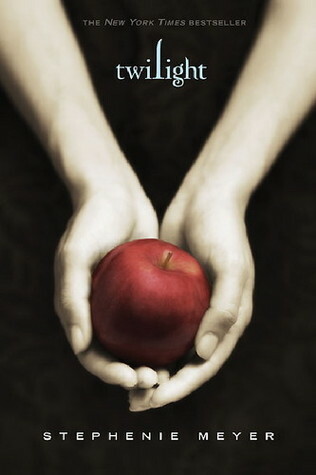 And I fully intend to reread the rest of Bella and Edward’s story, as well as all of Marchetta’s work. They’re different stories, different depths for different moods, but I found it interesting to read one after the other. In one case I was wondering why I ever loved it (I still like it, despite how much I make fun of it at times), but in the other, I wondered how I could go even two years without reading it. It left a little hole in my heart, as though that book belongs to me and me alone. It was a reminder of all I loved about it and more…all I love about reading. After an argument with her father, Kyra sees a blinding light. She wakes up later behind the local Gas N Sip with no memory of where she’s been. After she stumbles home, she finds out that she’s been missing for five years. In that time Kyra hasn’t aged a day. She has the same bruise she got goofing around with her best friend the night before she disappeared. She looks the same–but she feels different. And worse, her whole life is unrecognizable. Her parents have divorced, her mom is remarried and has another child, and her dad has gone over the edge, drinking and rambling conspiracy theories about alien abductions that sound closer to The X Files than reality. Kyra’s boyfriend, Austin, and her best friend are now twenty-two and away at college, in love with each other, living the life she was always supposed to live, bought together by the mysterious disappearance of Kyra. Now, her only friend is Tyler, Austin’s little brother. The last time Kyra saw him he was thirteen years old, but now he’s grown, he’s mature, and he’s trying to help her ease into her new life. I was really excited to read this because I love Derting’s series, The Body Finder. Or, more specifically, I love Jay Heaton (so I had some high swoon hopes here). Unfortch, this book didn’t do it for me. I was completely enticed by the whole alien abduction angle. I’m not a believer in that sort of thing, but I’m normally mesmerized by shows like Ancient Aliens and the like–mostly because there is a level of crazy there that is so sincere I have to respect it. I also thought the idea of Kyra coming back to her life five years later–physically unchanged, but her life in total dissaray– was very interesting. And yeah, the whole thing with the boyfriend and best friend hooking up? I’m not going to lie, it caught my attention because it’s so plausible that they’d fall in love from clinging to each other when they believed Kyra was gone for good. The problem for me is that, while this book had great potential, it fell really short of my expectations. Kyra’s dad has spent her five year absence going crazy and delving into the online forums of those who believe they’ve been abducted by aliens. 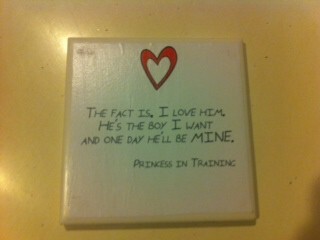 And when he tells Kyra this, she blanches, of course. But other than reiterating the bright light they both saw the night she vanished, Derting doesn’t really go into detail about what exactly convinced him he was on the right path. I think I would have preferred to be pulled in to that world. Instead, she focused on Kyra and Tyler. Now, don’t get me wrong. I love a good romance and Tyler is a solid character (I had a tough time with the younger brother thing, mostly because there is no way I would have ever gone out with my boyfriend’s little brother. Gross), and there are some good moments between these two. But Kyra, WHO HAS NO IDEA WHERE SHE’S BEEN FOR FIVE YEARS, spends an awful lot of time thinking about Tyler, and grinning like a fool, and thinking about how she shouldn’t be thinking about him, and being mad that her boyfriend and best friend are together, and thinking about Tyler more. I don’t know, I just think that realistically, she might have bigger things going on. Things progressed too quickly with Tyler, especially when, early on, we’re asked to believe that Kyra and Austin are hopelessly in love. There is obviously a big mystery surrounding Kyra’s disappearance, including two people following her. One is just some random, strange dude, and one is an agent from the NSA. While I found this all to be very cool, it went so slowly (wedged in between moments with Tyler and moments where Kyra wandered around her house aimlessly) and then suddenly, it took off and I felt like I got an information overload. 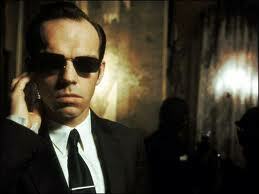 Funny enough, the agent following Kyra around reminded me of the guys from The Matrix. That is totally how I pictured him. In short, I was very disappointing in this book. It had potential, and while it wasn’t terrible (there were moments I couldn’t put it down), it wasn’t great.